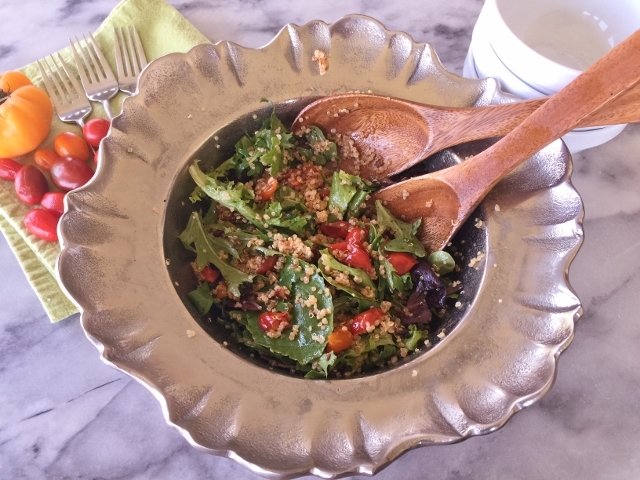 Bacon, Lettuce, Charred Tomato & Quinoa Salad - Recipe! - Live. Love. Laugh. Food. Bacon, Lettuce & Tomato Sandwiches are a summertime favorite, so why not eat them in a salad for a lighter option? 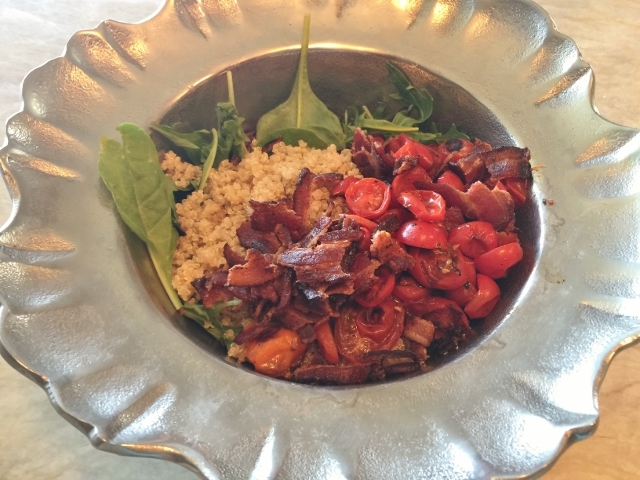 I love the saltiness of bacon with charred tangy tomatoes and the quinoa adds an earthiness that you don’t get in a sandwich. 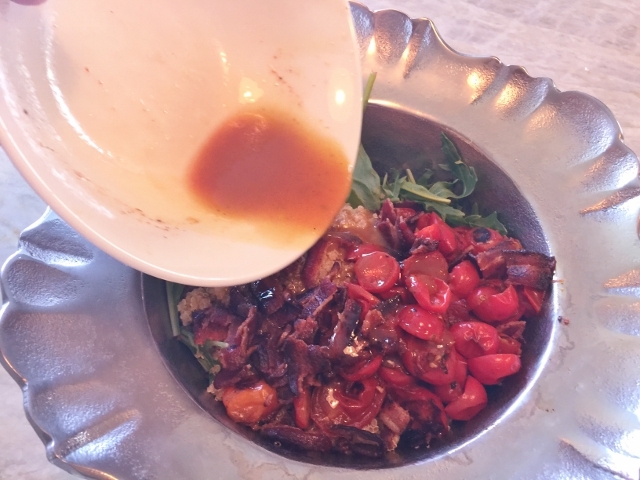 The vinaigrette is a simple combination of red wine vinegar and olive oil with a drizzle of Sriracha for a little kick. This makes a great salad for lunch during the week or a light dinner. 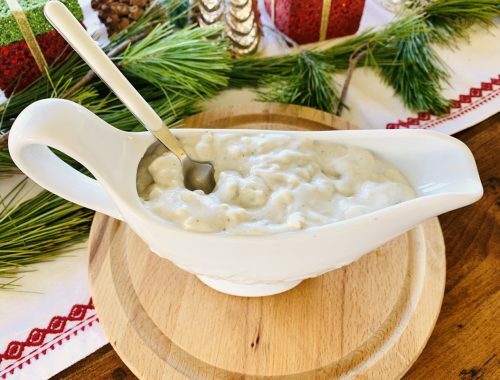 You can cube up some rotisserie chicken for an even heartier meal, but this recipe is pretty great just the way it’s written. 1. 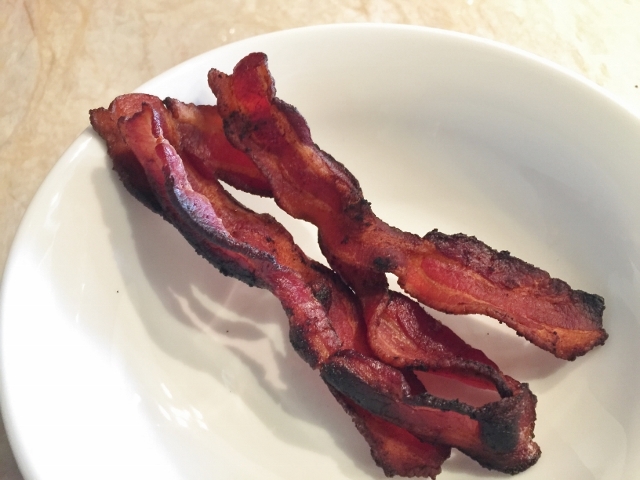 In a large skillet cook bacon and remove it onto a paper towel lined plate. 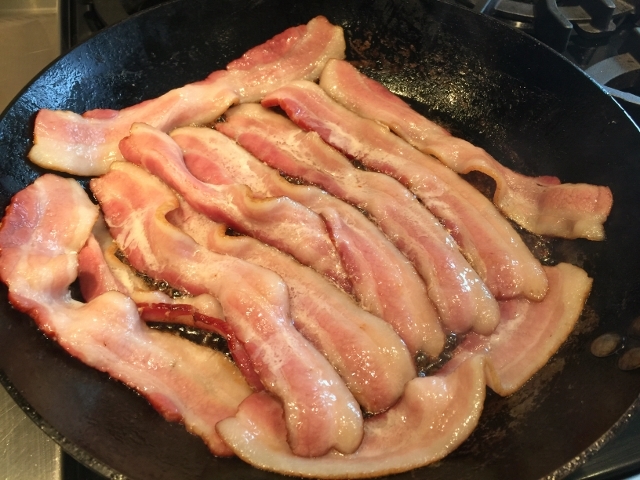 Drain the bacon fat from the skillet. 2. 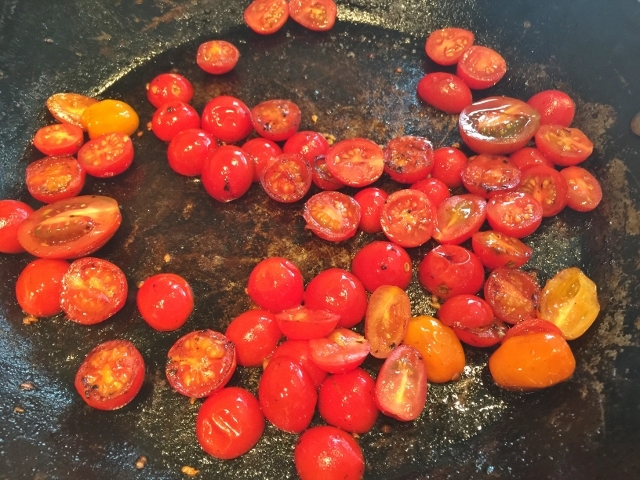 In the same skillet you cooked the bacon, add the halved cherry tomatoes and cook over medium-high heat, about 4 minutes. 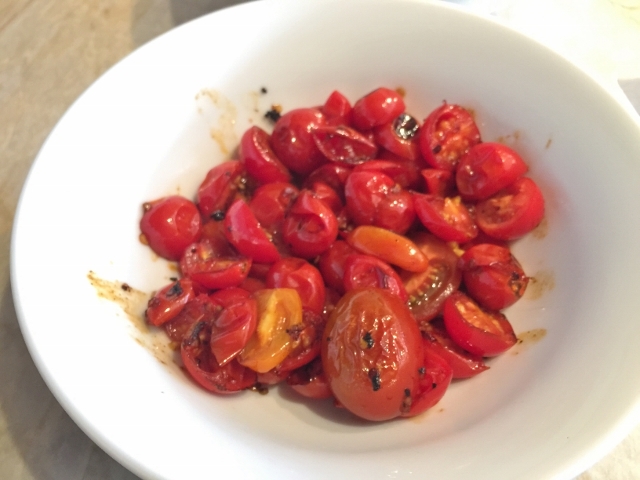 Place the tomatoes in a bowl to cool. 3. In a large bowl, add the mixed greens. Then, add the cooked & cooled quinoa, charred tomatoes and crumbled bacon. 4. 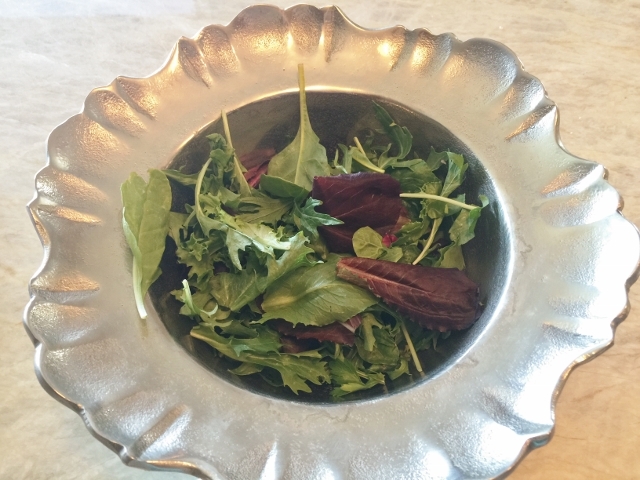 In a small bowl, whisk together the vinaigrette ingredients and pour over the salad. 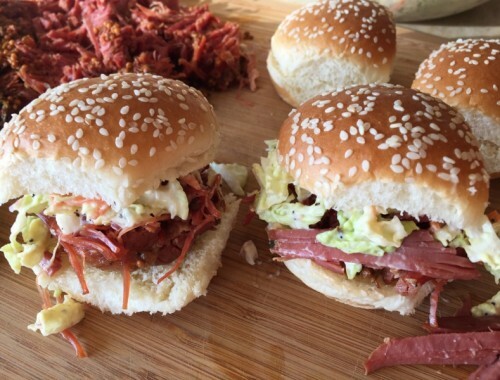 Gently toss together to combine the flavors. 5. Serve the salad immediately. Enjoy! 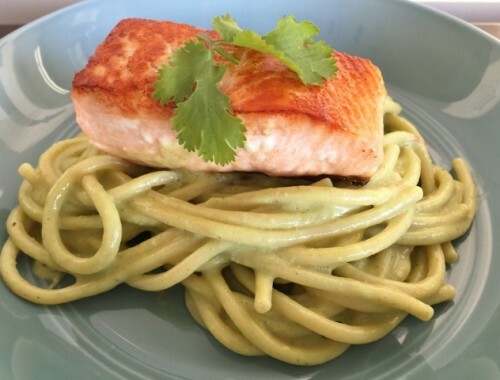 Avocado & Cilantro Pesto Bucatini with Seared Salmon – Recipe!